Rebecca L. Pearl, Ph.D., is an Assistant Professor of Psychology in Psychiatry at the University of Pennsylvania Perelman School of Medicine. She received her B.A. from Duke University and her Ph.D. in Clinical Psychology from Yale University. She completed her pre-doctoral clinical internship at McLean Hospital/Harvard Medical School and her post-doctoral fellowship at Penn. Dr. Pearl's research investigates the mental and physical health consequences of weight stigma. Her work also explores strategies to reduce weight-biased attitudes. 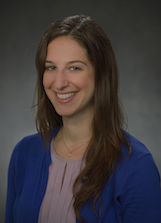 Dr. Pearl is currently investigating psychosocial risk factors and health outcomes associated with weight bias internalization, and potential interventions to decrease self-stigma among individuals with obesity. Dr. Pearl can be contacted at: University of Pennsylvania Perelman School of Medicine, 3535 Market St., Suite 3026, Philadelphia, PA 19104, 215-746-5129. Her e-mail address is rpearl@pennmedicine.upenn.edu. Pearl RL, Wadden TA, Chao AM, Walsh O, Alamuddin N, Berkowitz RI, Tronieri JS. (2018). Weight bias internalization and long-term weight loss in patients with obesity. Annals of Behavioral Medicine. Advance online publication. Pearl RL, Walton K, Allison KC, Tronieri JS, Wadden TA. (2018). Preference for people-first language among patients seeking bariatric surgery. JAMA Surgery. Advance online publication. Pearl RL, Puhl RM. (2018). Weight bias internalization and health: A systematic review. Obesity Reviews; 19(8): 1141-1163. Pearl RL, Hopkins CH, Berkowitz RI, Wadden TA. (2018). Group cognitive-behavioral treatment for internalized weight stigma: A pilot study. Eating and Weight Disorders; 23(3): 357-362. Pearl RL, Wadden TA, Hopkins CM, Shaw JA, Hayes MR, Bakizada ZM, Alfaris N, Chao AM, Pinkasavage E, Berkowitz RI, Alamuddin N. (2017). Association between weight bias internalization and metabolic syndrome among treatment-seeking individuals with obesity. Obesity; 25(2): 317-322.